Charismatic is not the same thing as honest! A Classic Political Reality [or a reality SHOW]! While the ignorant masses take sides vehemently AND violently; to the Elite-Crooks; whoever gives an edge - ANY kind of an advantage; is a friend [a temporary friend]. A bloody tink, that's what he is. Lula is not only charismatic. Lula put social programs at the top of his agenda during the campaigns and after election. From very early on his leading program was to eradicate hunger, following the lead of projects already put into practice by the Fernando Henrique Cardoso administration, but expanded by the new Fome Zero (Zero Hunger) program. This program brings together a series of programs with the goal to end hunger in Brazil, including the construction of water cisterns in Brazil's semi-arid region of Sertão, plus actions to counter teenage pregnancy, to strengthen family agriculture, to distribute a minimum amount of cash to the poor, and many other measures. (Source: Wikipedia). No wonder Lula is popular. The poor and destitute don't forget those who work to improve their lives. He sure did.....for himself....for his family and his cronies. As to his fantastic programme to erradicate hunger, Fome Zero - which was one of his miraculous campaign promises - it was a monumental failure, and had to be terminated after less than 24 months....why ? because of corruption ! At least you recognize the fact that programmes to try to erradicate hunger weren't Lula's idea, but leads he got from FHC....whose wife (along with Pauo Maluf) was the creator of various 'bolsas', later on unified by Lula. While Lula was successful on certain fronts, this will never outweigh his corruption. But many of those who think it does, are those who aren't particularly bright and don't realize that if he were to get back into power, he would be at the head of yet another cycle of corruption in the State-owned companies and the government. It would be pretty unrealistic to pretend that everything during Lula government was perfect. I would not deny that corruption did happen during his term in office. However, when evaluating a politician I look at the general direction of his/her actions. If we look only at some trees, we'll fail to appropriately evaluate a forest. While Lula was successful on certain “fronts”, this will never outweigh his corruption, you say. Are you sure? Corruption is and has been endemic in Latin America, but only since the ascension to power of popular governments in the 2000s corruption seems to have become an issue. 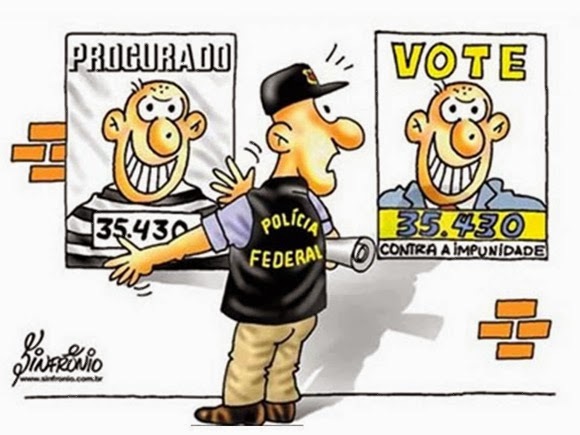 What about those who head the Brazilian government right now? They seem to be pretty good at exercising corruption--but that does not seem to bother you too much. If that is not an impressive feat for a country so dismally unequal, I don't know what it is. Again: perfect? Surely not. Exceptional? No doubt. His recipe? To benefit all. Brazil's business community has come to appreciate its one-time bogeyman, notes the same BBC story. Of course, the narrow vision of Brazil's ultra wealthy has kept most of the population in a state where they cannot contribute to society. Not Lula. Brazilians are staying in school longer, which secures them higher wages, which drives consumption, which in turn fuels a booming domestic economy, the BBC story notes. Yes, I'm sure. And true, while corruption has always been endemic to BZL, it only reached the levels it did after Lula came to power...the fact that the largest corruption cycle - the mensalão, petrolão, coincides with the popular, or should I say populist governments, is no surprise....All it took, was Lula and PT to reach power, to ignore their claims of honesty. Some of the reasons why it was never such an issue, until the 2000s, is because 1) the people, as a whole, were complacent; 2) Before the 2000s, people were largely uninterested in politics ; 3) the people started to be better informed only after the internet became available to the general public, accelerated by the social networks ; 4) the Fed. Police was revamped, with regards to both equipment / calibre of its members ; 5) Brazil was, for the first time in decades, reaping the benfits of a more stable economy, thanks to the plano real (which the PT always opposed, until much to their chagrin, saw it worked), started obtaining significant foreign reserves fm exports (fm mainly, but not only commodities), producing a volume of tax revenue unseen before, making it possible to steal in an ever bigger way (Crim Org in PB), and still make ends meet...until Dilma screwed things up. The current government (Temer), ironically, is only in power today, due to a backstage deal with the PMDB, in 2007, to not impeach Lula over the 'mensalão'. The 20 million 'catapulted ' to the middle class, are now back under the poverty line, thanks to the PT's crisis. Update yr numbers. His recipe ? to benefit all...himself, first. Others...? It is unfortunate that some people, who have never experienced what they write about, depend on reports or articles of other people, to express their opinions...as if they were experts on the subject. - The investigations are unending but the culprits - almost in all the cases - are innocent. Hence, in the Future: The corruption will proportionately be inescapably greater than ever. It is unfortunate that some people, simply opine believing their word is sacrosanct. Dispensing with obligation to bear the burden of proof by providing support. Have absolutely no rebuttal when an expert shows how remiss they are. This is how it’s done in real world, when you play fast and loose with truth you’re going to be exposed. 'Burraldo', you stepped right into it.